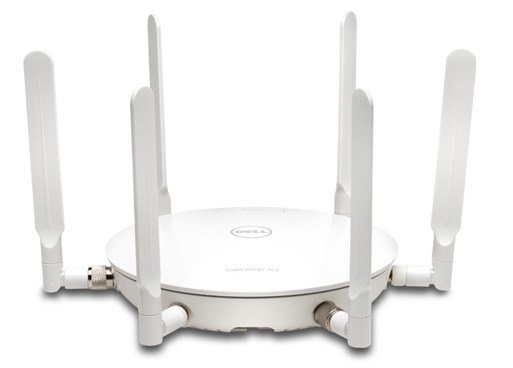 The Dell SonicPoint ACe offers secure, high-performance 802.11ac wireless LAN (WLAN) connectivity across the 5 GHz band with enhanced signal quality and range, simplified deployment, and ease of management. With support for the 802.11ac standard, the SonicPoint ACe can achieve a data rate of up to 1.3 Gbps while maintaining a higher performance level at greater ranges. The 802.11ac wireless standard operates in the 5 GHz frequency band, which is less prone to signal interference, thus enhancing signal quality. Dual radios, six external antennas and 3x3 MIMO result in more reliable wireless coverage. SonicPoint ACe can receive power from Ethernet and Gigabit Ethernet (GbE) cabling through an 802.3at Power over Ethernet (PoE) injector, as well as directly through an AC adapter. As a plenum rated access point, the SonicPoint ACe can be safely installed in air-handling spaces, such as in or above suspended ceilings. With dimmable LEDs (excluding power), SonicPoint ACe fits seamlessly into environments that need discreet wireless coverage.